Co-founder of microTOOL GmbH, a Berlin-based IT company, which has been specializing in tools for software engineering and project management for more than 30 years. Since 2013, Ursula has been Managing Director of Strategy, Sales & Marketing. Before that, she was Managing Director of Methodology & Training at microTOOL and in charge of developing methodology and training concepts for several generations of modeling tools. In the last couple of years her focus has been on integrating Requirements Engineering and model-based development into agile project management approaches. 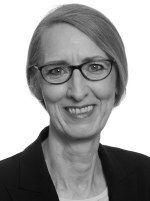 After graduating in mathematics at University of Hamburg, Ursula started her career as a system analyst at Siemens AG and as a methodology consultant for process-models and software engineering techniques at a consulting company in North Germany. Ursula supports IREB by participating in the Advanced Level Modeling working group.